Have been thinking of different things I can do on the blog, and one of them is to offer occasional juxtapositions of creativity that warm the heart, stretch the mind, quench the soul. So here is the first: a bringing together of two masters (to whom I’ve returned more than once on Q). 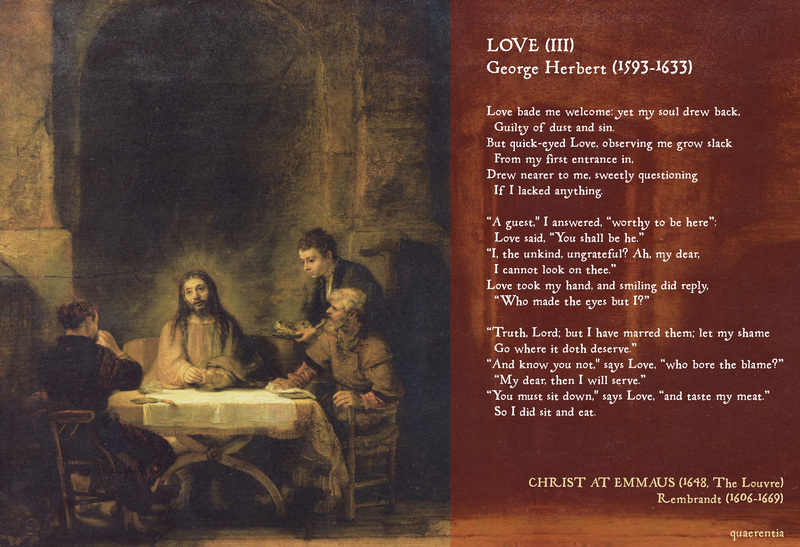 George Herbert was only 13 years older than Rembrandt – but the latter long outlived his English contemporary. I’ve no idea whether or not they knew of each other. I rather think they might have had much in common if they had – both experienced great worldly success and then obscurity. But more significantly, both had a profound understanding of the gospel of grace. It’s patently obvious – through the glittering artistry of Herbert’s poetry, and the poetic humanity of Rembrandt’s painting. So here is Herbert’s great Love (III), which depicts a reluctant house guest being beckoned in by a host full of grace. And Rembrandt’s 1648 painting of Christ at Emmaus (from Luke 24). Click on the image below to expand. Great web site. Lots of useful information here. I am sending it to some buddies ans additionally sharing in delicious.